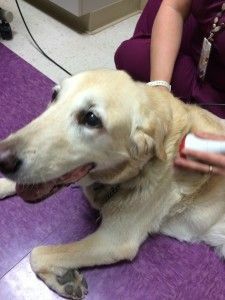 When I first heard about laser therapy treatment I was very skeptical. 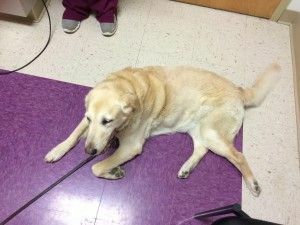 How could something non-invasive, that was administered without pain or discomfort to the animal, and did not require shaving the treated area, or taking additional drugs, have such fantastic results? Molly had been operated on for elbow dysplasia in BOTH front legs before she was one year old and had been on glucosamine/chondroitin ever since. Even so, age caught up to her and she began having trouble walking. Eventually, she was put on daily Rimadyl medication to help with the aches and pain in her front legs. Arthritis seemed to worsen overnight to the point one day when she came to an abrupt stop just 5 houses down the street. Arthritis (at the sites of the long ago leg surgeries) was coming on strong and the daily Rimadyl medication was no longer able to contain the pain. A good friend of mine told me that she had started taking her own dog to this clinic after hearing about their work with laser therapy. She hadn’t said anything to me about it earlier because of she, too, was skeptical and wanted to be sure it actually did some good before telling others. She told me that within a few visits, her dog was able to once again walk up and down the steps in her apartment. Enter Elm Point Animal Hospital. I contacted Elm Point and took Molly in for an initial check. We started therapy that evening. Molly just laid down on the floor as the vet tech turned on the laser therapy machine. 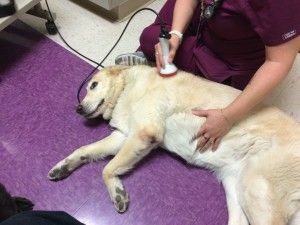 Treatment involved the tech running the laser over Molly’s shoulders and elbows on one side, then doing the same on the other side. All the while Molly just laid on the floor enjoying all the attention she was getting. No shaving, no shots, no noise…just the warmth from the laser soaking into her shoulders and elbows. 15 minutes per treatment – that was all it took. To my total amazement, after only 4 visits, Molly went from being able to walk only 5 houses to walking 18 houses down the street without stopping. After about two months of treatment, our “normal walk” was a loop about three-quarters of a mile long — and that continues to today. We did not increase her daily rimadyl dosage nor add any other pain meds which could potentially cause internal organ damage. Her quality of life is great – most folks can’t believe she is almost 14. (I could do with a bit of laser myself at times!) I’ve even seen Molly trying to chase the squirrels with Maggie in the backyard. I truly believe Molly would not be with me today if not for the laser therapy treatments. Molly turned 14 years old the first week of December, 2015. THANK YOU ELM POINT DOCTORS AND STAFF!